Political analyst from Strategic Outlook Institution (Turkey) Mehmet Fatih Oztarsu answers our questions. Should we expect any change in Turkey’s policy with the election of President Erdogan? Election of President Erdogan was a natural event. Domestic and foreign policy of Turkey will be the same as we’ve seen it since 2002. But changes in the parliamentary system of the country are expected. We will see the results in the coming months. Should Sargsyan’s greetings of Turkish President on his election be regarded as a sign of new attempts to rapprochement between Yerevan and Ankara? In Sochi, Sargsyan thanked President Ilham Aliyev for the fact that he had not started the war. In this example, we see that he has become much more likely to use a diplomatic language. Congratulations to Erdogan are normal. At the same time it shows a desire of Sargsyan to improve relations with Turkey. However controversial the domestic policies of Turkey are, Turkey’s foreign policy knows that it needs to move to the West. Armenian media reported with reference to some confidential sources that President Erdogan is going to visit Armenia in memory of the victims of the events of 1915 in April next year. Is this a reliable information? We all know about the tendency of the Armenian media to speculate. They have a decent amount of books that teach fiction as a fait accompli. No one knows what Erdogan will undertake on April 24, 2015. I do not think that even now he has taken any final decision on this matter. Everything can change depending on the time and circumstances. Of course, if Sargsyan takes positive steps on the Karabakh issue, the visit could take place in Yerevan, as Turkey is too sensitive about the Karabakh conflict. The events of 1915 are less important for Turkey than the Karabakh issue. This is because the conflict escalated, and hundreds of thousands of people continue to live in poor conditions in connection with this situation. As I said, the process of normalization of these relations can only accelerate the development of positive dynamics in relations between Azerbaijan and Armenia. By the way, Turkey closely followed the recent escalation in the area of the Armenian-Azerbaijani conflict. How would you comment on the view that Turkey is one of the few foreign players who can actually contribute to the solution of the conflict? As you know, some of the wounded Azerbaijani soldiers are being treated in Turkey. Foreign Minister Davutoglu personally visited them, which caused outrage in the Armenian media. Turkey is ready to take the place of a mediator in the Karabakh issue. Ankara can take important steps to bring together the parties’ positions and constantly expresses the corresponding intention. Of course, Yerevan and Baku need to speak in favor of this. Can Armenia eventually heed the arguments that the withdrawal of its troops from the territory of Azerbaijan will be advantageous only to itself and connect the country to beneficial regional projects, participation in which is unreal fot it yet? In my opinion, the biggest problem are the leaders of Armenia, who have links with Russia and consider it important. The fact that these are the leaders who participated in the occupation of Karabakh, creates a particular problem. The military past and unconditional dependence on Russia holds Armenia aloof from regional integration. There were dozens of protest actions past year. However, due to lack of support for the Armenian opposition from the West, it did not bring any effect in the fight against Sargsyan’s regime. They have two options. 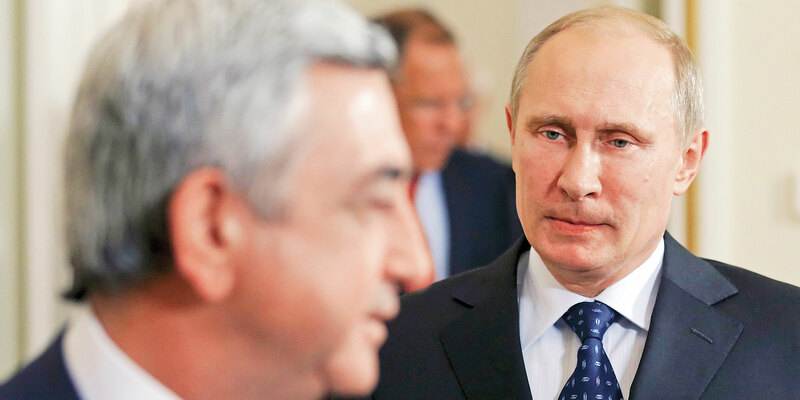 Either Sargsyan begins to pursue a different policy and turns Armenia into a completely different country or there will be a West-supported revolution, and Sargsyan and oligarchs that are close to him will be toppled. Both of these options will change destiny of Armenia and the region to the best.